Every month, I try to write an informative newsletter that will hopefully take you to a new level. Today I want to discuss something that’s been around for centuries: the grid. In fact, a student of mine told me recently that artists used the grid method in Egypt to paint their murals. I’m not surprised because they are extremely helpful to the new as well as the experienced artist. My mentor and career coach does not like grids. She thinks there are inhibiting, holding back the expressive artist within. While I can see her point, overall I disagree with this belief. Grids are perfect for the artist to get a fairly accurate drawing. It still requires “looking” at the object that's being drawn, even more so because the artist must translate what is seen in each segment on the paper. So who uses grid? Lots of folks. 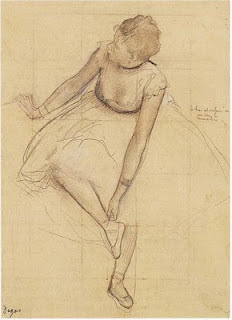 One artist who used it a lot was Degas while he was drawing his dancers. As you can see, his 1” grid appears in one of his famous dancer drawings. A grid can be as simple as using the “rule of thirds,” where you divide the page into equal thirds vertically and horizontally. The rule of thirds is a guideline that we use in composition to ensure that pictures are well-proportioned and have strong focal points—those areas that fall onto the “sweet spots,” that is , where the lines intersect. 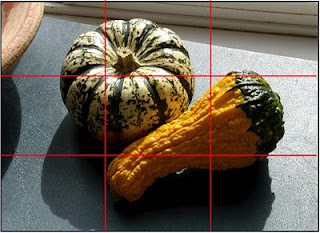 Thus, by using the rule of thirds as a grid, you are accomplishing two things: composing your picture properly and drawing your picture truthfully. Let’s take the above picture as an example. 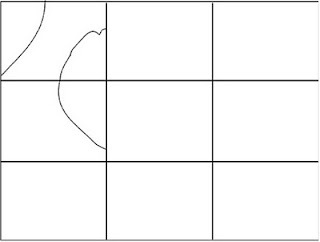 This is how I would begin my drawing, using the above grid. 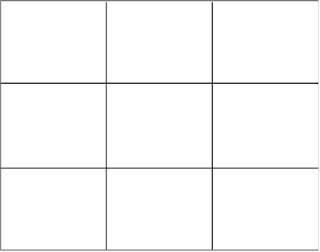 I draw the same grid on my paper. Next I begin to draw what I see in each section. By concentrating on one square at a time, I am not feeling overwhelmed by the whole picture in front of me. I can also use this method when I’m outside by creating what’s called a viewfinder. Just take a baseball card size hard-plastic sleeve and draw the lines right on the plastic. You can also make one with a small mat board frame and attach strings to the sides where the third lines appear. There are other grids as well. Many people use a 1” grid. In many of my classes and workshops, I hand out grids you can create on plastic presentation plastic sleeves, which again you simply draw the lines and then slip your photo inside. No matter what kind of grid you draw, just remember to create the same proportional grid on your drawing surface. In other words if you are using a 1” grid, then be careful to draw the same 1” grid on your paper. I even use a simple cross-grid to help me get things in place properly. These grids don’t have to be fancy. Next month I will start another series, this time on color. We’ll look at the two basic triads: primary colors (blue, red and yellow) and secondary colors (green, orange and violet). Until next time, have a great February with all my love.